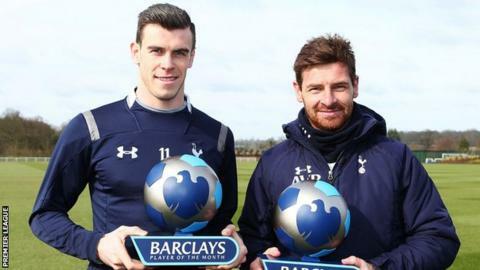 Tottenham boss Andre Villas-Boas and midfielder Gareth Bale have been named Barclays Premier League manager and player of the month for February. Champions League-chasing Spurs won all three of their top-flight fixtures during a run in which winger Bale, 23, scored five of their six goals. "We work together, and whoever gets the award, it is a team game," Bale said. "Very honoured to be the player of the month. With the manager getting an award too it has been a great month for Spurs." "It has been another excellent month," Villas-Boas, 35, added. "We have to keep this going until the end." Bale's form has led to him being described as the third-best player in the world, thanks in part to his match-winning goals against West Brom, Newcastle and West Ham. Villas-Boas said Bale was entitled to be grouped with Lionel Messi and Cristiano Ronaldo among the best players in the world. "He is world class and those two players are," said the Spurs boss. "At the moment Gareth is showing the level of those two players, who have won so much throughout their careers, including European trophies. He still has to achieve that and we hope he can achieve it with us." The Wales international attributed the quality of his recent displays to his happiness with the north London club. "I have been enjoying my football probably more than I ever have and when you are enjoying your football, you give your best performances," he said. In February, Tottenham extended their top-flight unbeaten run to 11 games as they established themselves in third place in the table. They now head into Sunday's derby four points ahead of Arsenal. "This is a reward we share with everyone," Villas-boas added. "We have teams in behind us chasing the same objectives. We have to bridge the gap and that will put us in a more comfortable position."